A friend of mine saw the work I’ve been doing with beeswax, honey and, most recently, bee pollen and suggested I take a look at Wolfgang Laib. I can’t believe I hadn’t seen his work before! His exploration of the ephemeral and eternal through a minimalist approach is very appealing to me. His choice of materials obviously resonates, but also exploration of duration of time, ritual, repetition and symbolism of material. His pollen works, wax room works and milkstones are of particular interest to me. His use of white, yellow, gold, black reflects the colour palettes and materials I have been using, especially in my sculptural pieces, but it has reached a place that I obviously never did. My works in progress videos at present have a set that uses the very same colour palette and similar symbolic materials, drawing on work I created earlier this year and last year. Probably for the best that I didn’t see this body of work earlier, because I might have been either too influenced by it, or scared away from working with the materials I had chosen for fear that I wouldn’t be able to avoid steering too close to Laib. I feel that if I wasn’t working the way I am now, that this would be the kind of direction I might be moving in. It can be so difficult deciding what direction is right for the work, especially when there are potential directions that are formally very different but could still produce the outcome the work requires. I’ve identified my work as NOT minimalist and NOT formalist, but I still have a big place in my heart for that way of working, so who knows? everyday, ordinary, kitsch, ironic, sardonic, mocking, irreverent, quirky, cute, dry, safe, political (although everything has a politic), polemic, didactic, formalist, minimalist, comfortable, homely, nostalgic, witchy, new age, religious, technological, sensible, restrained. I’ve been looking back at art historical references over the last few weeks. There is an obvious nod in my video work towards religious iconography, baroque painting (particularly the Italian Baroque) and to symbolist artists. 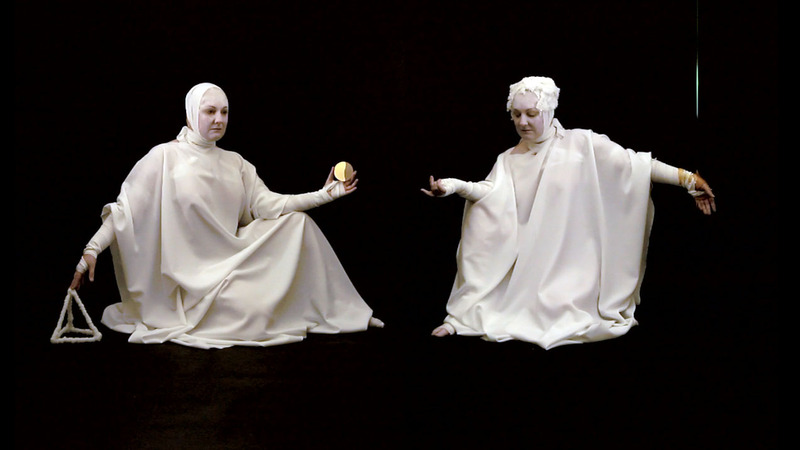 In my last series viewers noted the references to classical beauty ideals; high foreheads, white faces, wrapped head coverings and the fact that the figures appear austere and devout like an ‘abbess’ or a ‘monk’ (those words were put forward as descriptions). I have taken a look at different areas of art history that are referenced in my work and tried to pick apart a little of why this is the case and how I can work with it more fully to consciously use these references rather than them being somewhat unconscious decisions on my part. This isn’t an in-depth analysis of these works, but more of an overview of some of the stylistic influences that I have been exploring and that have been expressed in my work. Starting off with painters from the Baroque period who use a similar tenebroso technique. This is an extreme form of chiaroscuro where there is a violent contrast between light and dark, with the darkness being a dominating feature of the image. These dark shadows and deep foreground colours have come through in my video pieces “Hive Oracle” and the “Sublimation” series. Figures emerge out of the darkness with no fixed setting. The figures often have intense or unusual expressions and the action in the paintings has a viscerality that was not present in works from the Renaissance. Women have action and agency that was previously absent from most artwork. An outtake from my Hive Oracle (2015) series where the figure emerges out of a formless, dominating blackness. St John emerges out of a black background into stark contrast where his skin takes on an almost deathly pallor. Looking at Caravaggio’s “Judith” the pose and gesture are quite awkward, the image focusses more on getting everyone in shot and making sure the composition is pleasing than of the realities of actually cutting someone’s throat in this way. 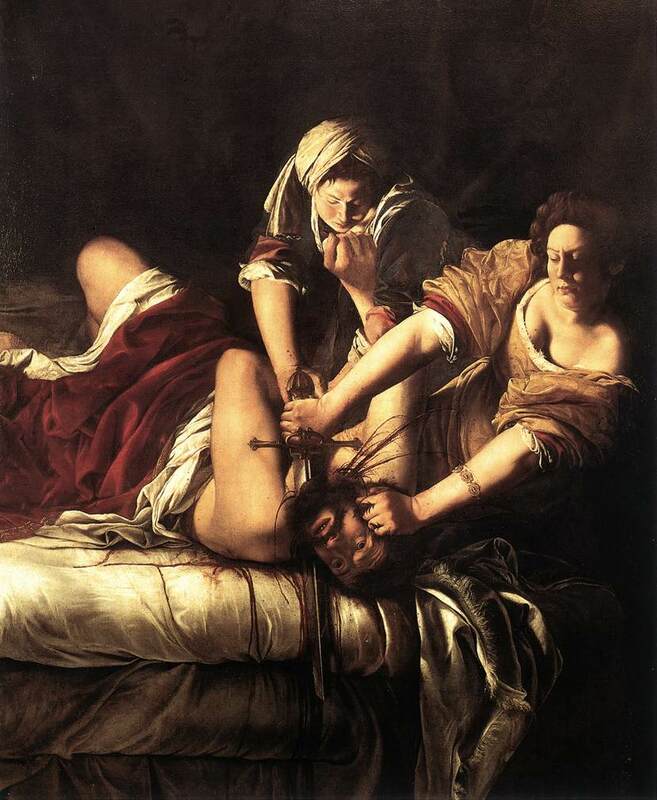 Judith isn’t exerting much force, so even though the image is visceral, it misses the violence of how a scene like this would play out in reality. Skip forward a few years and we see an artist I love, Artemisia Gentileschi, taking on the story in a much more believable way. The beauty of the gesture and composition is sacrificed to realism and violence, the women are powerful, determined and dominant. The figures are foreshortened and stacked behind each other – very different from the ideal composition at the time. 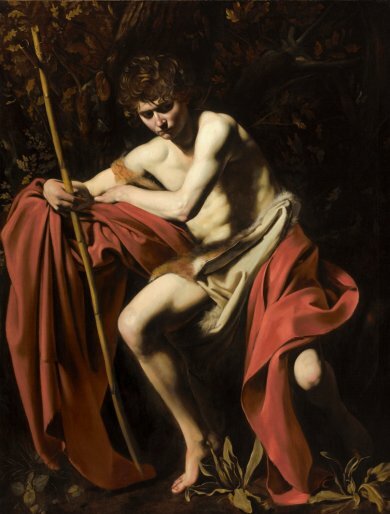 I like examining this painting in contrast to the Caravaggio so wanted to include it here. This links to another aspect of my video work I have discussed with faculty and peers; the subject of gesture. I use a certain amount of posed and unusual gesture in my work that reflects the gestural tone of classical painting and sculpture. Often the gesture and pose in these works is expressive rather than natural, they are poses you could make but probably wouldn’t. The gestures create a theatricality in the work, an elegant exaggeration of reality. 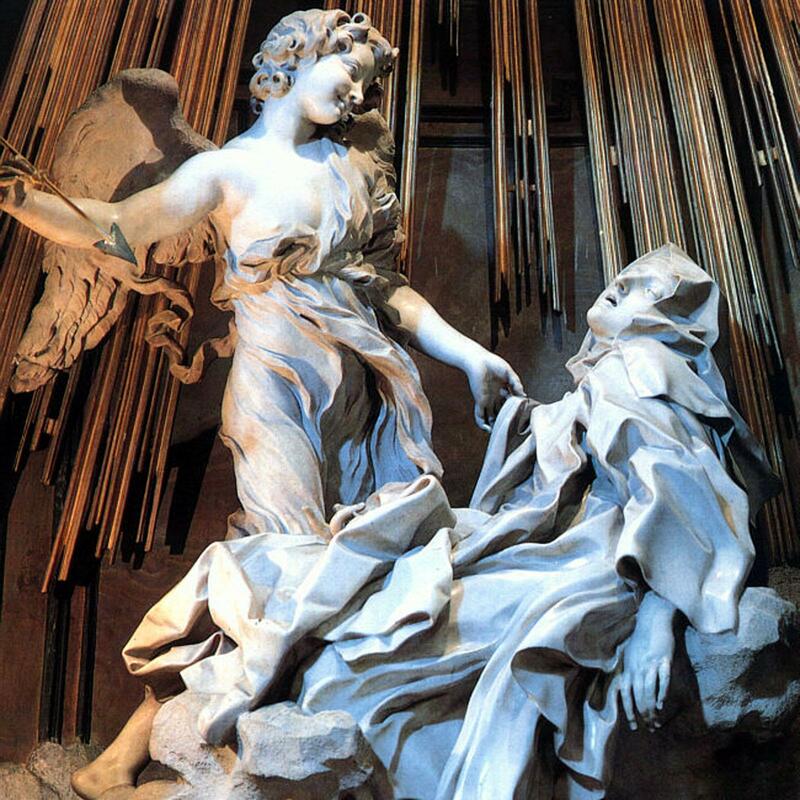 In this flowing marble work St Teresa swoons in ecstasy as her heart is pierced by a beatific angel. A very early work by Gentileschi that has not yet adopted the intense chiaroscuro of her later paintings. The figures make exaggerated, theatrical gestures. Pose and gesture in my own work Sublimation Fig. 3 (2015) The austere appearance of my central figures draws on ideals of the sacred, of dedication and otherworldliness. 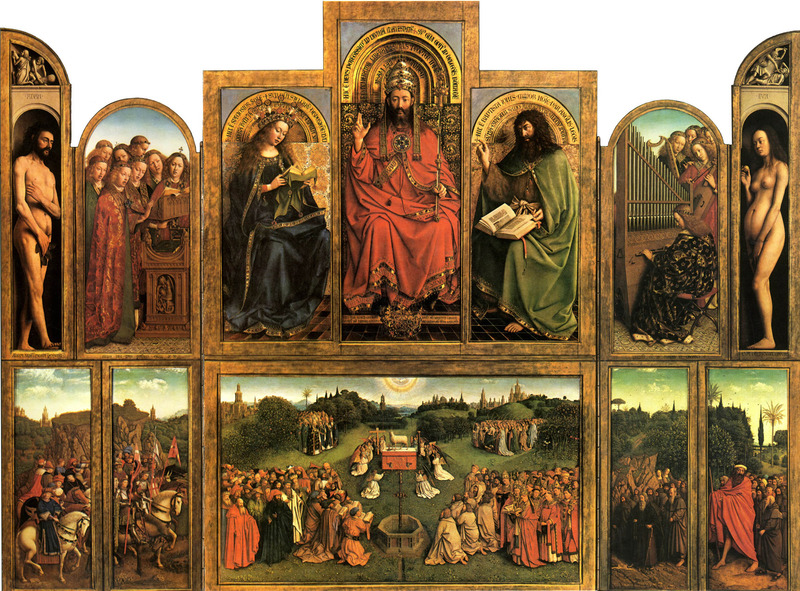 Jan van Eyck (1430-1432) Ghent Altarpiece (Interior) One of the most famous examples of the the altarpiece with christian iconography. The imagery covers both the interior and exterior of the tri-fold screen. I spent a bit of time revising the stylistic conceits of religious icons and altarpieces. The set’s of 1 or 3 central figures and the ability for a narrative to be told across a presentation that can be viewed all at once have some parallels to what I have been working with in video. 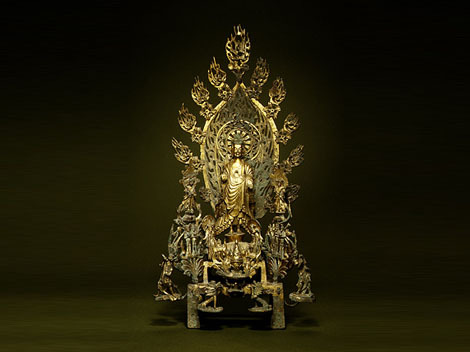 The central figures are often realistically imagined (in line with the stylisation of the era) but with ornamentation behind them in gold and this is something that I have also observed in my more modern influences. 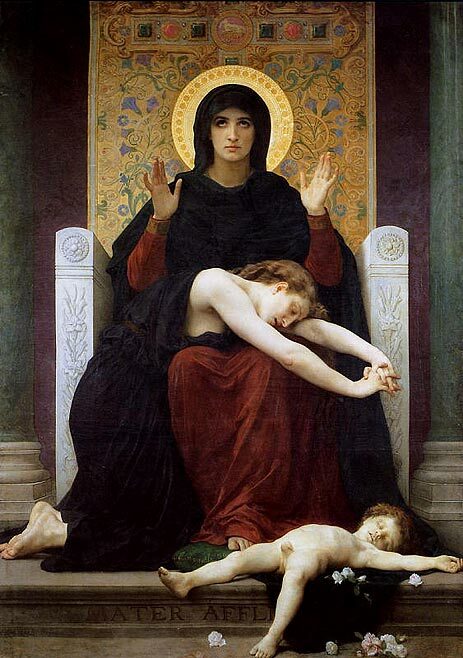 A more modern approach to the religious icon and one of a series of paintings of the Virgin Mary by Bouguereau. She displays the exaggerated gesture, the ornamentation in gold behind the central figure and the central, vertical composition seen in earlier icons. 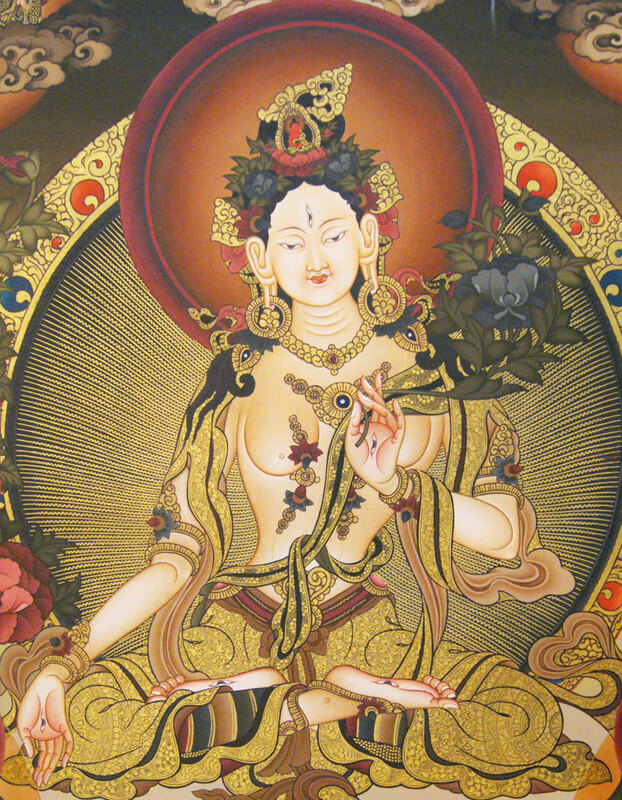 Tibetan White Tara thanka (section) Date and artist unknown. Bhuddist iconography in sculpture and painting for comparison. Elegant symbolic gesture, ornamentation and central placement of figure. I’ve been fascinated by the use of overlaid ornamentation in this work for a long time. It’s so unusual and it creates a a film or screen over the subject that sets them apart from us – definitely ‘otherworldly’. 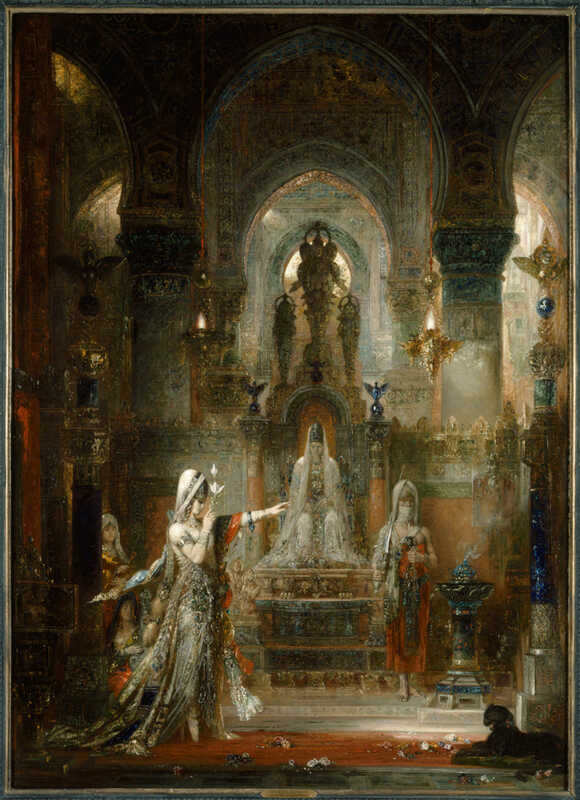 Moreau’s women tend to be voluptuous and bejewelled rather than austere. Another artist from this era that has been useful for me to revisit is Gustav Klimt. His work has unfortunately been aped by a lot of contemporary decorative artists and so it almost looks cliched, but observing the real Klimt it becomes obvious that the imitators can’t come close. 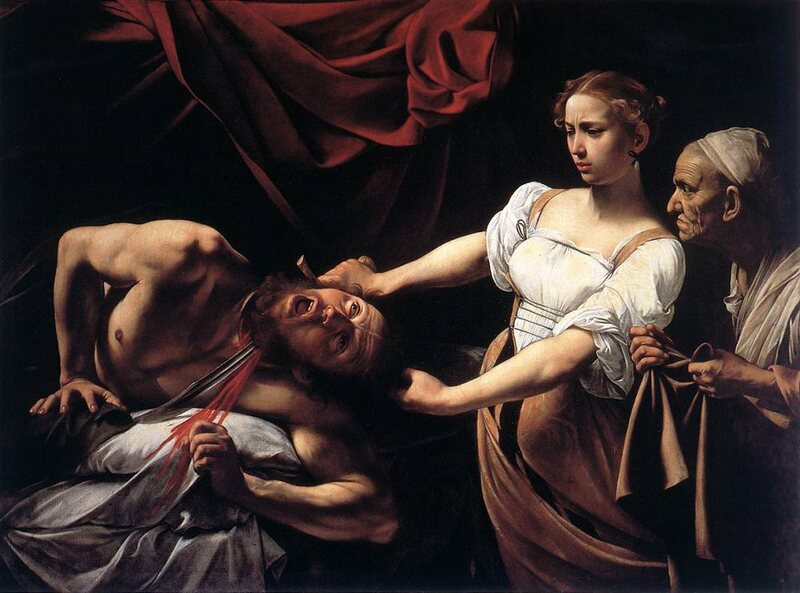 Oh look, it’s Judith and Holofernes again! 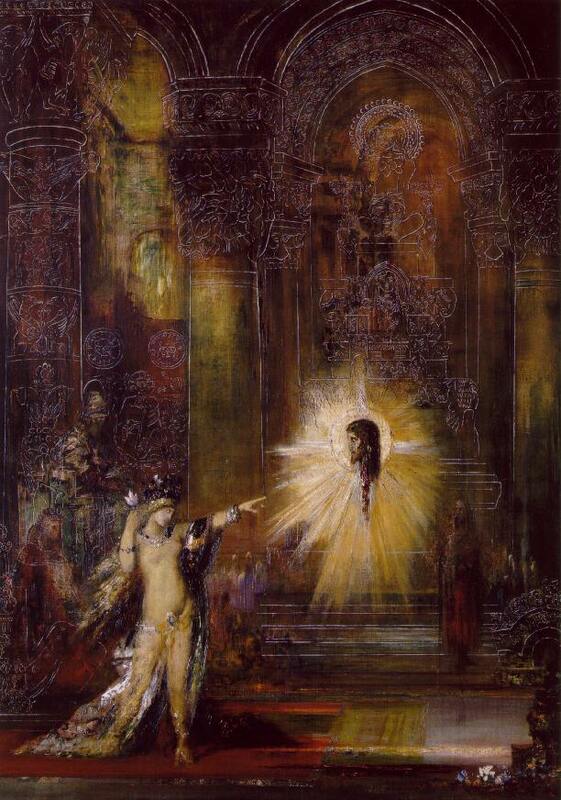 The symbolist artists loved depicting the strong, passionate women with a touch of darkness about her. Here Klimt is riffing off the stylistic elements of icons with the rich, gold, flattened ornamentation setting off painterly naturalistic figures. The patterned ornamentation also calls to mind Japanese kimono design and woodblock images. I love the juxtaposition of flat pattern with 3 dimensional flesh. Recently I have been considering my use of black backgrounds in video and wondering how the work might fair with other colours or tones. The use of white on white appeals to me because it retains the otherworldly strangeness but loses the usually dark connotations that go with magic and the occult. Looking back on all my work over the last 2 years there is a funny switching from dark to light to dark to light, in that my work both stylistically and literally switches black and white! 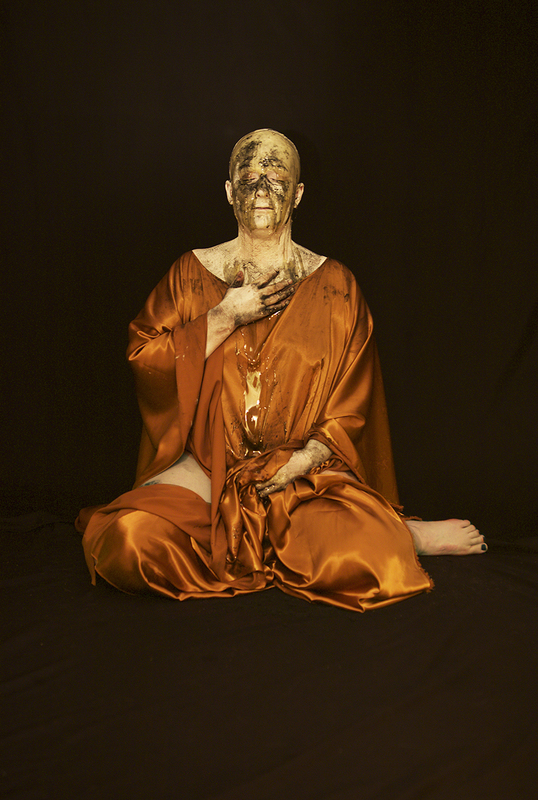 I enjoyed working with the white and gold/yellow of the first honey/wax works and the live performance ritual so would like to explore that further. I’m intending on shooting the same sequences on different backgrounds to see how the change from the black tenebroso effect to the white on white effect plays out. This exhibition is a retrospective of Fiona Pardington’s work from her early days at Elam right through to the present day. Unlike the Yvonne Todd exhibition that took up both floors of the gallery, Pardington’s show was only on the ground floor. I felt like I would have liked to have seen more, as it seemed a little constrained. I was a bit unsure of the way the work was grouped; it didn’t appear to be chronologically arranged, as early work appeared in several spaces, but I don’t think it was thematically arranged either. The work seemed to be in ‘pockets’ of related pieces rather than in whole bodies and I found that decision a bit scattered. I would have loved to see a whole room, or a whole wall of one body of work, then a whole wall or room of another rather than 2s and 3s scattered around. Overall it felt like it was skimming the surface of a career when delving more deeply into selected areas might have been more satisfying. I was quite familiar with Pardington’s earlier black and white work so I was really keen to see the more recent colour works, especially the ‘vanitas’ inspired photographs. The works that struck me the most were those with very deep blacks, intense colour and use of painterly chiaroscuro technique. With my own video works shot floating and groundless against a black void, there images were useful for me to observe. I was really interested in in the use of coloured lighting in particular, the way it moulds and illuminates aspects of the objects. 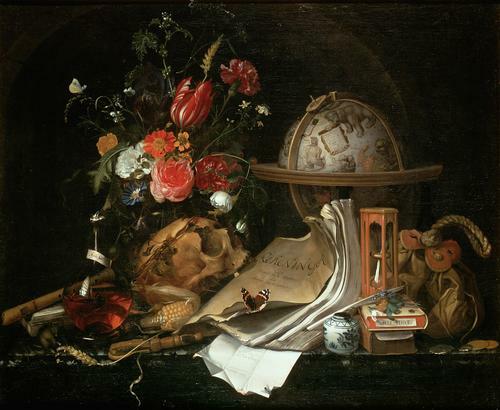 The objects often appear as singular icons imbuing them with a specialness, a reverence and an otherworldliness. 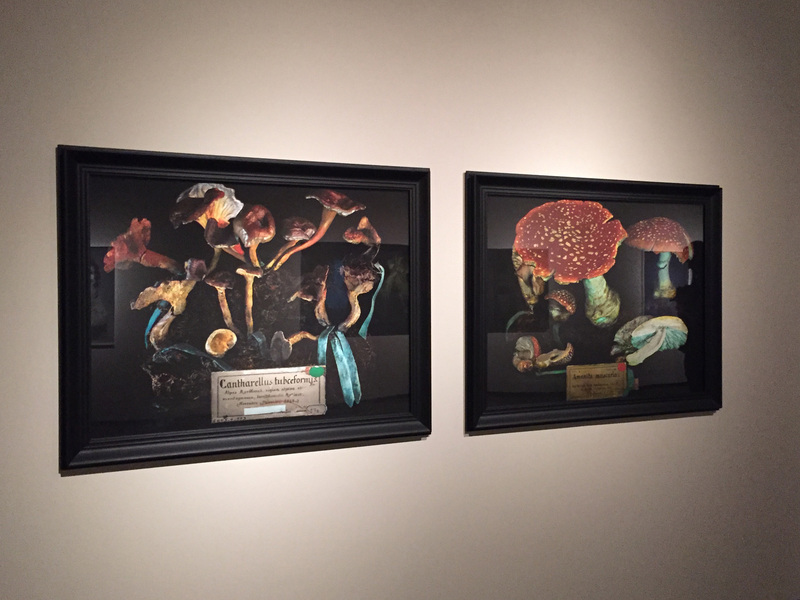 There was one particular aspect of the show that I found difficult to deal with and that was the choice of highly reflective glass over nearly all of the works. 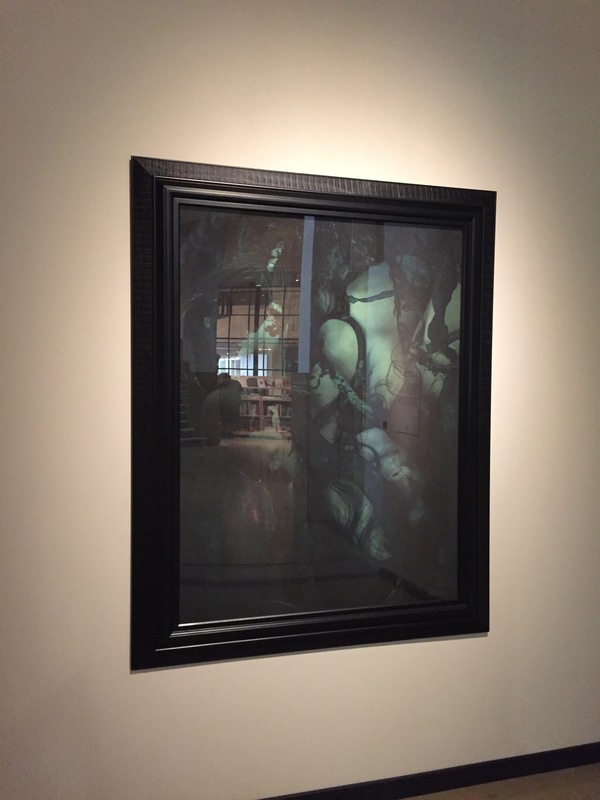 With many of the images being dark and with complex details, the reflections on the glass created a barrier between the work and the viewer. I wanted to spend time with the works and let them unfold in front of me, but this was often impossible due to not being able to find a view point that mitigated the reflections. 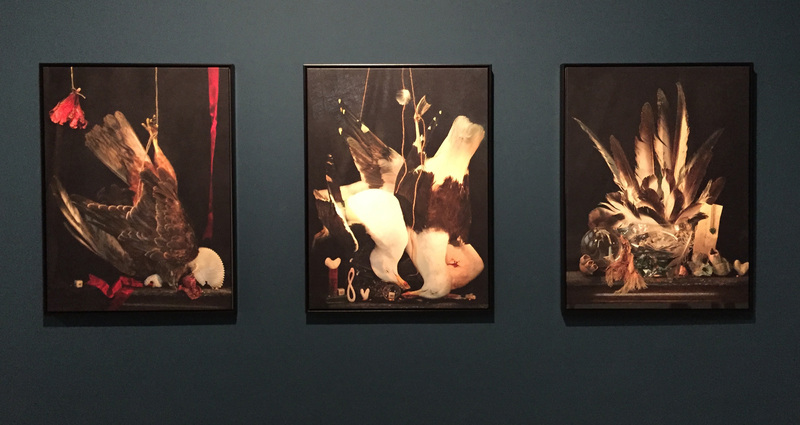 My blog photographs are actually easier to look at than the full-size works themselves because in the flesh the reflections are even bigger and more distracting. I’ve often wondered if I’m not understanding something in this choice by photographers to use such reflective glass? Is there some aspect of the display technique that I don’t get? 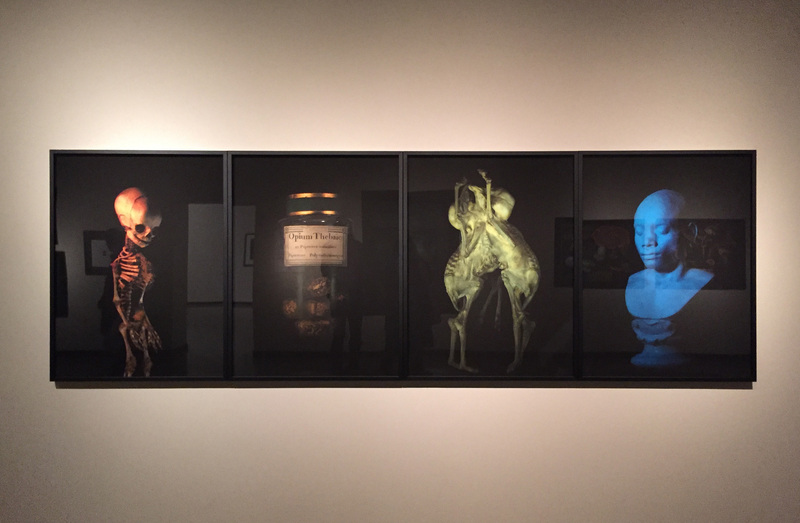 There was one set of still life works that were printed onto a canvas substrate and with light framing and no glass. This was interesting because it created much more of a sense of immediacy to the work. 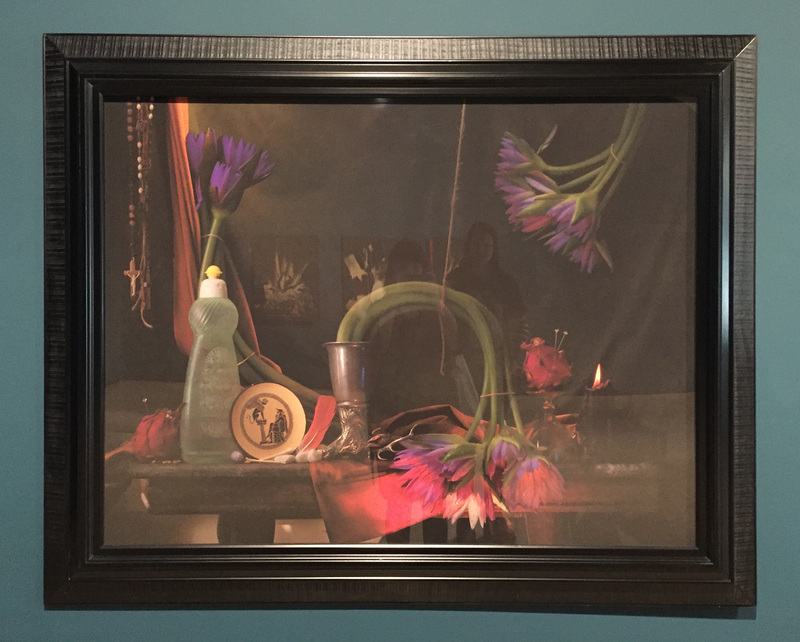 The reflective glass creates a barrier separating the viewer from the objects, whereas the canvas works removed this barrier making the imagery vibrant and alive. This might not be what the artist wants from the work though, the use of the glass barrier does place the work into a space that is ‘other’ from the viewer and this could be a desirable outcome. I’m not entirely sure that either display technique is doing the work justice though. Overall I enjoyed the work a great deal, but was really distracted by the display choices. Because of this I’ve found it quite difficult to talk about the work itself which makes me feel frustrated and dissatisfied. I hope the exhibition comes to the Auckland City Art Gallery so I can revisit it and see what has changed between venues.